This is Max’s story – a dog that’s unknowingly part of the war against cancer. Human cancer. Max is a nine-year-old goldendoodle who lives in Toronto. Like a lot of goldendoodles, he’s a pretty sweet canine and very family-friendly. “I knew we had a good dog when he was about two,” Max’s owner, Andrea Horan, told W5's Sandie Rinaldo. But something changed with this sweet dog back in the spring of 2018. He started to limp. At first, Andrea thought he’d pulled something or hurt his paw. But after several days, it didn’t get better. One day she came home and Max didn’t even get up to greet her. That was very unusual. So she took him to the vet. Max had osteosarcoma -- a bone cancer that’s common in dogs. Their options were dismal: put him down or amputate his leg and follow that up with chemotherapy. And despite that expensive treatment, he still likely had less than a year to live because with osteosarcoma, the cancer usually comes back. Andrea considered putting him down because the alternative didn’t sound very attractive. Before she decided what to do, Andrea did some research, specifically searching for any clinical trials that were testing treatments for osteosarcoma. The Mona Campbell Centre for Animal Cancer is part of the Ontario Veterinary College at the University of Guelph. The cancer centre was one of several conducting a clinical trial on a new vaccine. The vaccine contained modified listeria – bacteria that are designed to fire up the dog’s immune system to attack specific cancer cells. Most dogs that develop osteosarcoma aren’t cured when the tumours are removed because the cancer usually spreads to other parts of the body. But in a pilot study, this listeria vaccine showed great promise. In some dogs, it delayed the return of the cancer and extended the lives of dogs for two to three years longer than those that didn’t receive the vaccine. That’s a big difference in a dog’s life and something for vets to be excited about. Andrea contacted the animal cancer centre and begged them to let Max into the trial. They agreed. So, Andrea went ahead with the slightly-less-traumatic decision to let surgeons cut off her dog’s leg. The surgery was a success and the change in Max was almost instant. With the painful tumour gone, he sparked up and quickly learned to live with three legs. 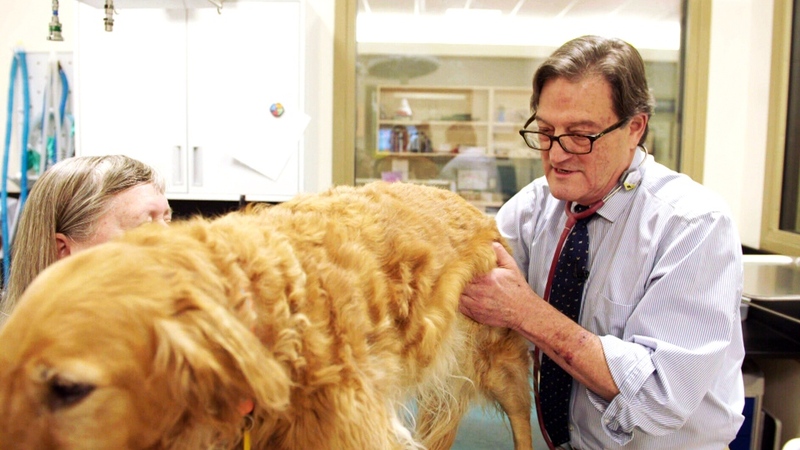 “People say dogs are born with three legs and a spare,” says Dr. Paul Wood, who is a veterinary cancer specialist at the cancer centre who’s been supervising Max’s treatment. Woods has an excited interest in something called comparative oncology. That’s the study of cancers that naturally occur in animals and the comparison to its human counterparts to identify treatments. 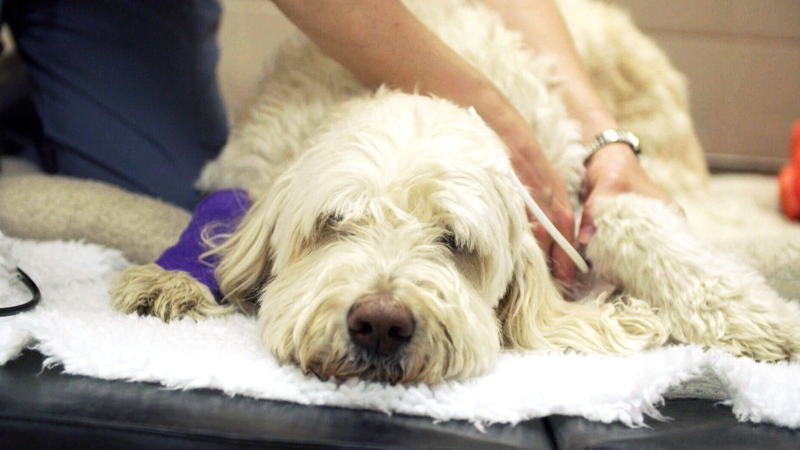 Comparative oncology is just one example of how veterinary and medical doctors collaborate. Since the 1970s, vets and MDs have worked together to find treatments, therapies and drugs that not only fight cancer, but other afflictions that we share with dogs and cats, such as epilepsy, heart disease and even anxiety. The field has led to new surgical techniques, new ways to deliver chemotherapy and new drugs: all tried on dogs and subsequently used for humans. Max has undergone four chemotherapy sessions and the vaccine injections. For now, he’s doing well. When he goes to the dog park, most people don’t immediately notice his missing leg because he happily keeps pace with his four-legged friends. But it’s early days. Most dogs that undergo an osteosarcoma-related amputation and chemo typically live for about one year. If Max lives significantly longer than that and other dogs in the clinical study show similar results, that vaccine just might have made a difference. That’s why the human world is watching this three-legged dog.